Have you noticed a frustrating fall in Facebook's organic reach? If you have a Facebook business page that you update on a regular basis, chances are you have noticed a decline in your engagement rates. 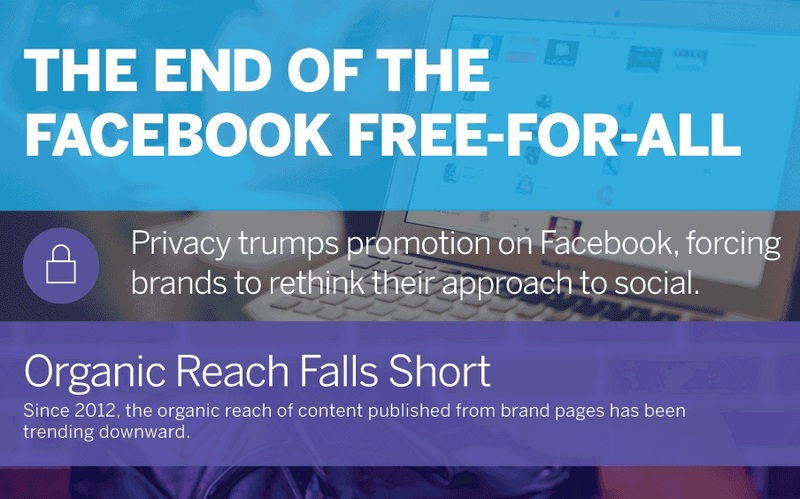 Since 2012, the organic reach of content published from brand pages has been trending downward. According to an infographic from Marketo, 2 - 8 percent of fans see your Facebook posts, only when you've a large following. Which is of course not good for small businesses. So, should you quit Facebook? Is it the end of the Facebook free-for-all? This infographic has the answer and some great marketing tips too! If Facebook isn't working for your business then expand your digital marketing efforts to sites and tactics with higher ROI. Invest in Instagram, the app boasts 58 percent higher per-followers interaction for top brands than on Facebook. Pinterest and email marketing are also good options.